Measurements: 2.77 x 4.6 inches, or 70 x 117 mm. Back of card: Dark purple, with a darkly defined figure eight. May be inverted. Comments: At first I thought this was another Tarot of Reflections, only this time, the reflections were top to bottom, rather than side to side. The reflected images represent the value of the card when inverted. Which in my view trivializes the cards (there is already the Quick & Easy Tarot with its delineations printed top & bottom. It is intended for beginners.) One of the reasons not to put an inverted image on the card is that such an image puts us into an interpretative straightjacket. The regular image on the card tells us its meaning, by means of visual inspection. Having done that, we should already have a sense of the inverse meaning. When the inverted meaning is given to us, it may well not be what we - the readers - feel should be the inverted meaning. This is a risk of this presentation. Great sorrow is wept from her eyes as she grieves a great loss and a failure of her own accord. So the Five of Swords would seem to mean about the same, upright or inverted. It is only a matter of intensity, or so it seems. But we look again and we see a single image: A man about to impale a woman, who screams at the prospect of her own death. Once we see this fusion, we are unable to get it out of our minds. Which supercedes words in a book. If we see the card upright, death comes to the prostate female from above, from a superior source. If we invert it, death comes from some deep, primordal force that will drag her down with it. Two valid interpretations. These are, in fact, better interpretations than given in the book, and because of the sword itself. It's too big for self-destruction, which is why daggers, not swords, are used for ritual suicide. But it's the ideal length to kill the woman below. 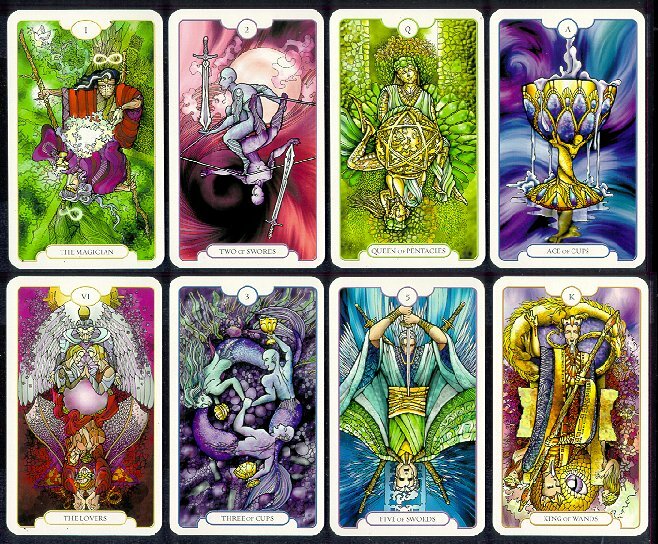 Elsewhere, all the figures shown in the major arcana wear masks. The back of the book says masks indicate the archetypal nature of the cards. I would imagine the archetypal nature to be indicated by the entire image. None of the faces/masks are big enough to show what sort of archetype is being indicated. Otherwise, masks, in general, indicate the truth is being hidden, or that we are being deceived. When all 22 card have this feature, we would guess the major arcana are a step removed from us, for better or worse. Which, strictly speaking, is true. The minor arcana are scenes from life. The majors represent extraordinary, largely unseen & uncontrollable forces. The original figures in the major arcana were superior figures in the Italian Renaissance. To transpose them to modern times, we would expect to see the President, the Vice-President, various cabinet secretaries, the governor of the state, famous movie stars, tycoons, etc. In other words, nobody you know, nobody you've ever known, maybe somebody who gave you an award once, at best. Put masks on these people: They are not as they seem. They inhabit a world which is closed to lesser mortals. Which they indeed do.